Warm, fun and heartfelt, Wild Rose is a feel good film in all the right ways. Whilst predictable at times you will find it hard to not become emotionally invested in Rose’s story as she navigates the world of country music and the difficulties of raising two young children. Acclaimed but sometimes under the radar War and Peace (2016) director Tom Harper helms an uplifting and heart warming tale of an ambitious young Scottish woman with dreams of becoming a country music star in Nashville, Tennessee. Hitting all the right notes with a wonderful leading performance from Jessie Buckley supported masterfully by Julie Waters, Wild Rose is an intimate portrayal of a single mother’s relationship with her two kids and their grandmother as she struggles to fulfil her own aspirations whilst juggling her job and her responsibility to her children. Wild Rose opens with its titular character Rose-Lynn Harlan being released from prison as her fellow inmates yell to her “You’re gonna be the next Dolly Parton,” as she signs out and reluctantly has an electronic ankle monitor fitted forcing her to abide by a curfew that doesn’t allow her out between 7pm and 7am. Revealed to be care-free if immature, Rose visits her boyfriend before going to her Mother’s house to reunite with her young children. Left alone in her new apartment with her two kids (a situation none involved are happy about) Rose starts a new job as a cleaner in order to save up to travel to Nashville and make a name for herself in the country music scene there. Whist working for her new employer, Rose strikes up a friendship with the lady of the house leading to Rose needing to decide between her own hopes and dreams, and the responsibility to her family. Jessie Buckley gives an excellent performance as Rose and she brings to life a very well written and well developed character. Rose matures in such a natural way that even though some of the plot points are quite predictable, they are so well woven into the plot that you hardly noticed that you saw it coming. Couple that with her incredible country voice Buckley is most certainly the stand out performance in an all round great cast. Julie Walters brings experience and grace to the role of Rose’s mother Marion. The chemistry and relationship between the two is believably strained and utterly emotionally enthralling. Rose is rash, unreliable and completely fearless whereas Marion is responsible, wise and cautious. The balancing between the two character’s points of view when it comes to what they want for Rose’s future and by extension, Rose’s kid’s future is completely relatable to any son or daughter who has had disagreements with their parents. Unfortunately as briefly mentioned, Wild Rose can come off slightly predictable. It hits all the notes a feel good film like this should hit and doesn’t really offer much in the way of twists, turns or surprises. Some interesting visual cues alleviate it slightly but it is still noticeable in parts that this film is meant to pull at your heart strings and it does so in such a way that can seem calculated at times. However the performances and the grounded nature of writing creates a warmness to the whole affair that is hard to resist, even for the grumpiest of viewers. George Steel, of Peaky Blinders and War and Peace fame, heads up the cinematography and delivers a wonderfully intimate visual style. The camera comes in close to the characters, we are not at a distance, we are in the room with them resulting in much greater emotional pay offs from the smallest of facial expressions during character interactions. Furthermore when the need comes that the camera needs to pull out and show the scale of a situation (mostly during the scenes in which Rose performs live), as audience members, we don’t forget the intimacy of the close ups leading us into a much greater appreciation for the large crowds that Rose attracts for her performances. We have a wonderful understanding of both how it is to be on stage for Rose and how it is to be an audience member watching her perform, with both being equally as gratifying. Furthermore the soundtrack is a wonderful testament to classic and modern country music alike. 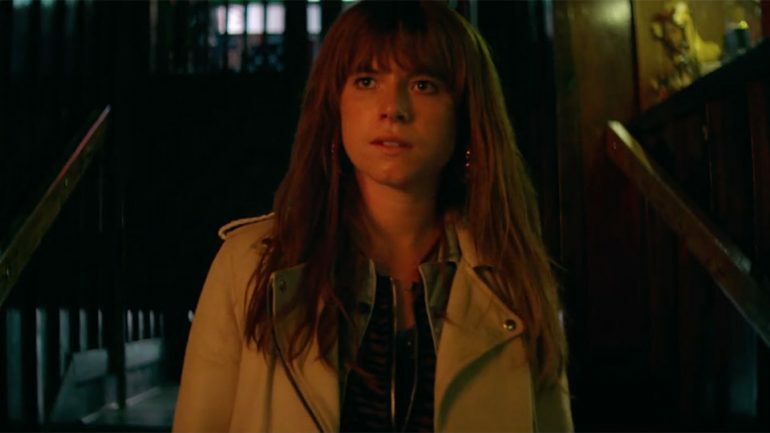 Jessie Buckley performs most of the tracks with some original versions of the songs sprinkled in and one original song written for the film snuck in at the end. Lovers of country music will certainly enjoy hearing some classic tracks and new listeners may be turned onto the expansive genre from this film. Whist suffering from fairly predictable beats and plot points throughout, Wild Rose is a wonderfully warm tale of family and responsibility as a young woman comes to know who she is and how she wants to live amidst her responsibilities to her children and her responsibility to her own ambitions. With great songs, an intimate visual style and a grounded script, Wild Rose is certainly one to enjoy whether you’re a fan of country music or not.